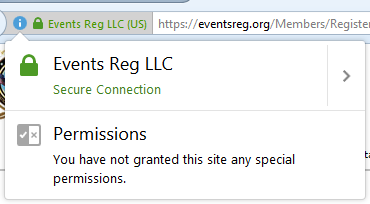 EventsReg takes personal information and financial payments. 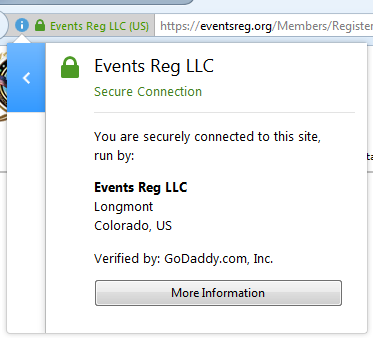 For your protection, we have registered our site for EV SSL (extended validation secure socket layer) and been authenticated through GoDaddy.com. According to Wikipedia, an (Extended Validation Certificate) is "An Extended Validation Certificate (EV) is a public key certificate requiring verification of the requesting entity's identity by a certificate authority (CA). EV certificates are mainly presented by web servers to web browsers for use with SSL/TLS connections." SSL - secure socket layer - is a means by which the information between your browser and our servers is encrypted to protect the content, your information, from prying eyes. https:// -- this security layer is ONLY applied when you are using "https://" (the 's' stands for secure). 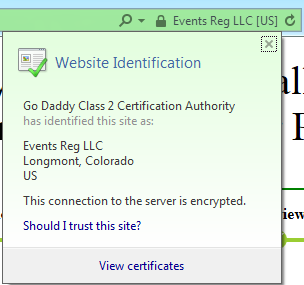 Your information is safely communicated over the internet when you are connecting to a site using https:// and that an extra level of scrutiny of that company entity, by a reputable authority, has occurred when there is an EV SSL. Here you will notice there is no company name, green highlight, or lock icon. This means you are only using http:// and NOT the secure option. This same general model is used for ALL broswers, certificate authorities, and websites (not just ours). No matter where you go on the web, look for this model to know that your information is safe in transit.